Historically, Canada and Mexico have both brought significant oil supplies to refiners in the U.S. In 2006, Mexico and Canada were both exporting 1.7 million barrels per day of oil to the US. Mexico and Canada have been waging a silent battle for market share in the US crude oil refining market. 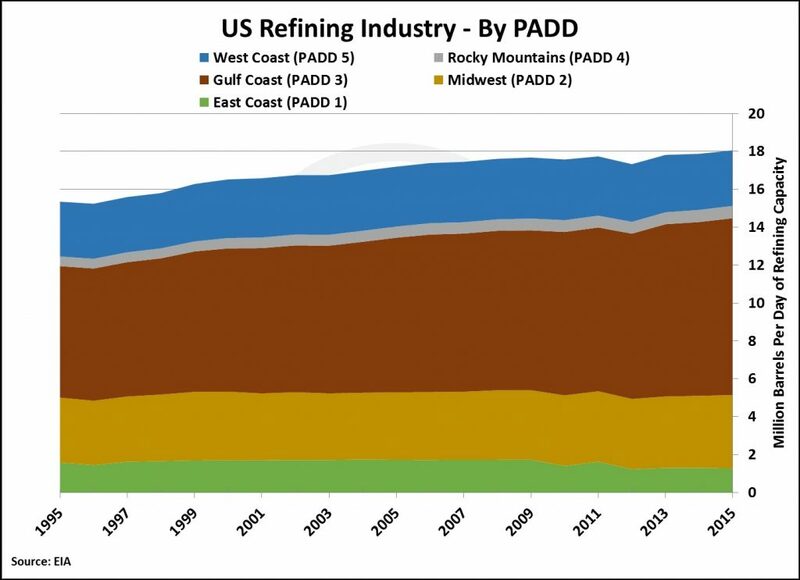 Since 2006, crude oil exports from Canada and Mexico to the US’ largest refining complex in the US Gulf Coast (Petroleum Administration for Defense Districts 3 or “PADD 3” or “Gulf Coast”) have changed dramatically. Historically, Canada and Mexico have both brought significant oil supplies to refiners in the U.S. In 2006, Mexico and Canada were both exporting 1.7 million barrels per day of oil to the US; however, the Mexican and Canadian crude oil market share was fairly segregated – Mexico dominated the Gulf Coast and Canada dominated the US Midwest (“PADD 2”). The 2008 financial crisis lead to a major shift in Mexican and Canadian oil exports to the U.S. and Canadian oil was at a distinct advantage. 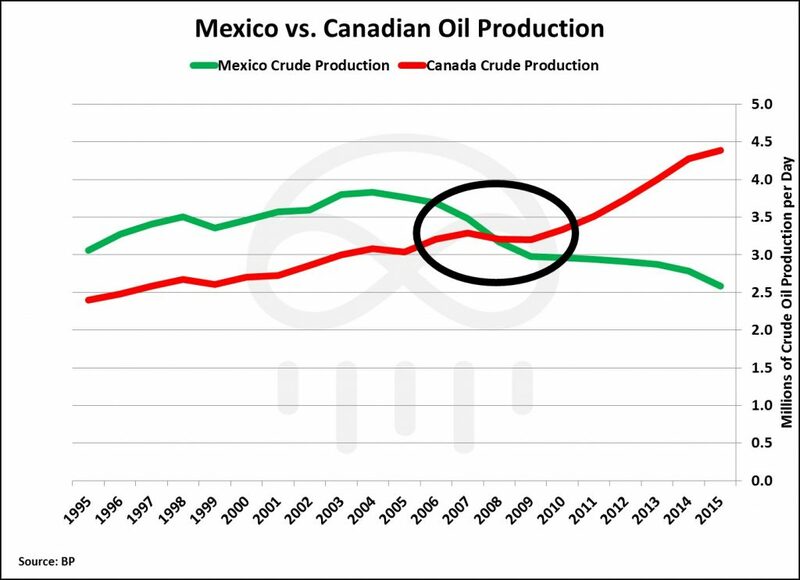 Mexico was already facing a decline in oil production from 2006 and the country would see oil production fall by 19% into 2009; meanwhile, Canadian crude remained unchanged. Into 2015, Canadian oil production increased by 37% and its oil exports to the US increased by 77% leading to a need for Canadian oil exports to find larger markets for its highly viscous (“heavy”) crude. Canada’s flood of heavy oil exports into the US was met with climbing oil production for the US shale revolution. 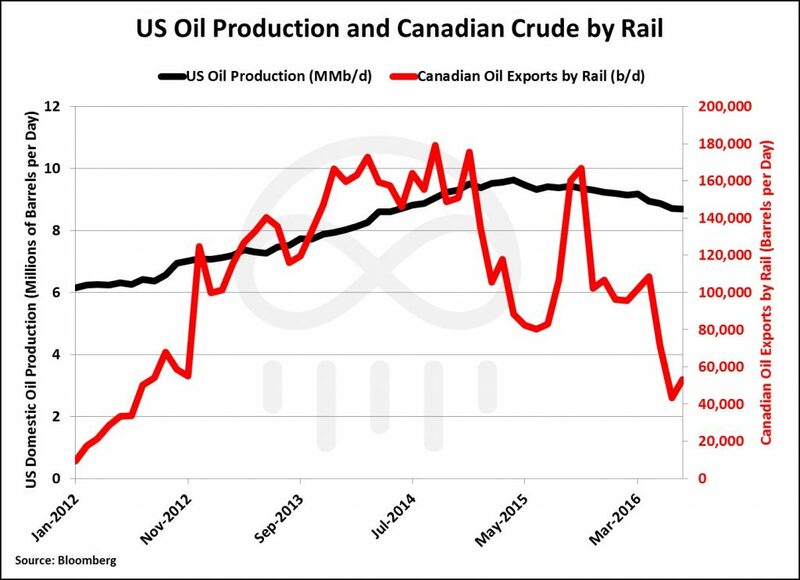 The flood of both light US shale oil and heavy Canadian crude oil in the U.S. restricted transportation of Canadian crude to US refining markets. Canada needed to find alternative methods from traditional pipeline transportation of oil to the U.S. and, thus, started exporting oil by rail. 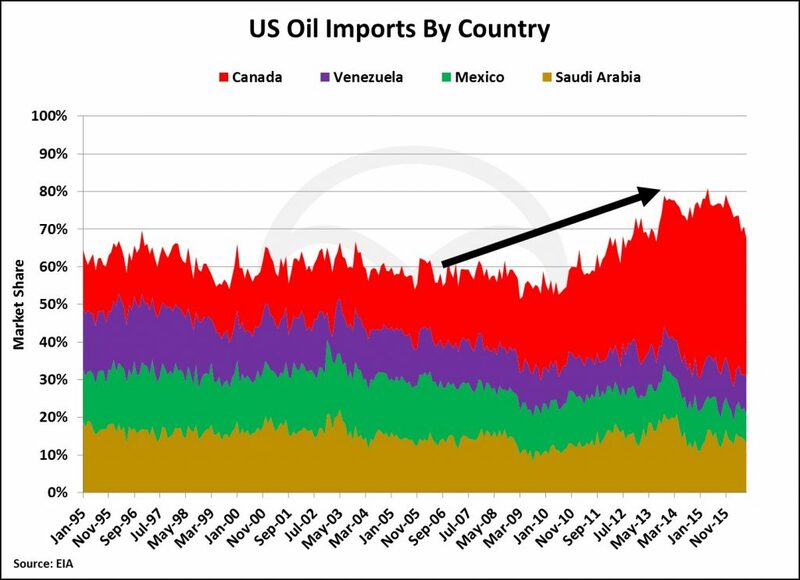 Canada was exporting so much crude to the U.S. that transportation infrastructure simply could not handle the flood of oil. Subsequently, in order for Canada to push more oil into US markets ahead of US domestically produced oil, Canadian oil was priced at an increasing discount to US oil prices. 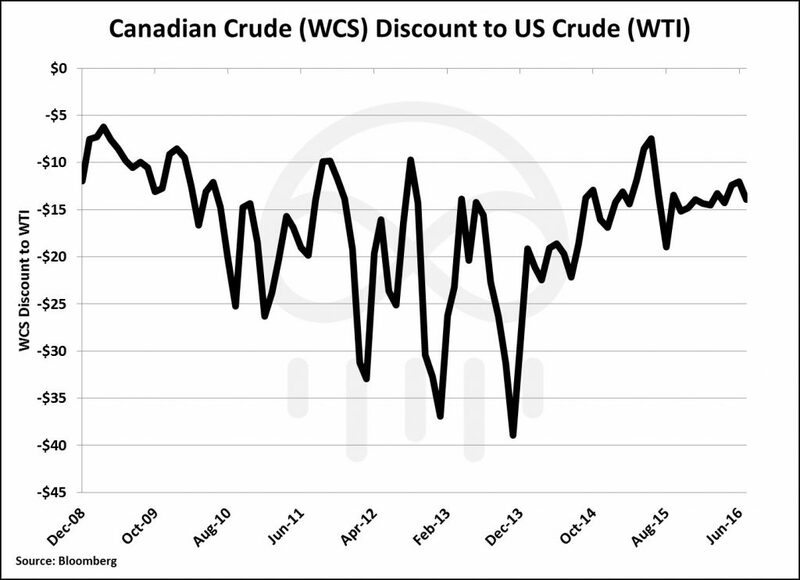 This discount made Canadian oil more attractive for refiners to import into the US using relatively expensive transportation methods like truck, rail, and barge, and caused Canadian crude to replace other imported crudes in the U.S. Discounted Canadian oil kept flooding into the US market and had to find new heavy oil refining customers above and beyond the US Midwest. Canada increased its oil exports to the US West Coast (“PADD 5” or “West Coast”) by 114% from 2006 to 2016 and doubled its market share in PADD 5 from 9% to 18%. However, the largest change in market share came from Canada’s increased presence in the US Gulf Coast. In 2006 Mexico was the Gulf Coast’s largest crude supplier – supplying 1.6 million barrels per day of crude oil or 30% of all Gulf Coast crude oil imports. In 2006 Canada was not even a forethought for Gulf Coast refiners, but as Canadian crude became cheaper and more means of transportation were used to carry Canadian oil, the glut of Canadian crude flooding the US made its way down to the US Gulf Coast. 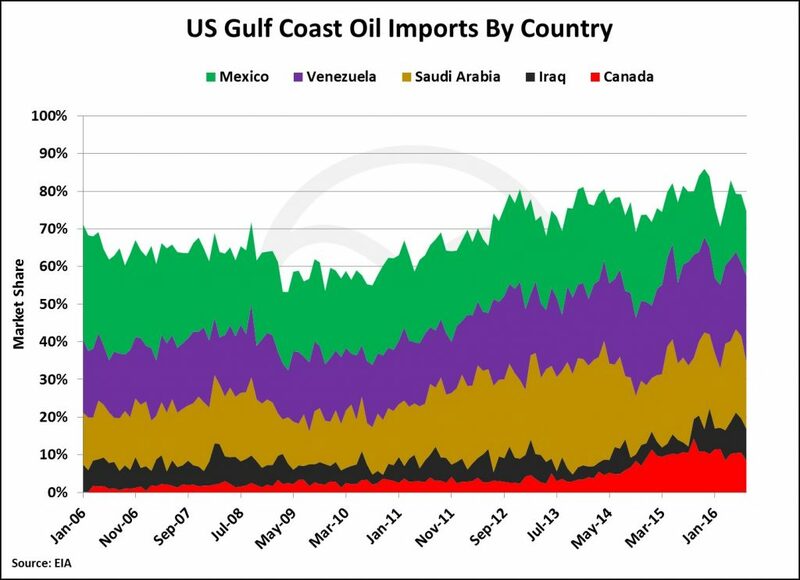 As of 2016, Canadian crude makes up 10% of all imports into the US Gulf Coast and has cut into market share from Mexico. Mexico’s Gulf Coast crude oil market share has been halved since 2006 resulting in a 1 million barrel per day drop in oil exports to the US Gulf Coast. Mexico attempted to make up the loss in market share in the US by exporting more oil to Spain and India, but that increase made up less than 10% of the exports lost to competition in the US Gulf Coast. Mexico is now taking pro-active efforts to stem the natural declines from large offshore fields that resulted in reduced Mexican oil production and lost market share in the U.S. One such effort is the Mexican government’s constitutional reforms ending the 75-year monopoly Mexico’s state-run oil company, Petroleós Mexicanos (PEMEX), has had over Mexico’s oil & gas sector. The government has opened its oil & gas blocks to private investment and have already conducted separate auctions for shallow offshore and onshore blocks. The next phase of auction blocks in Mexico will take place in December 2016 and will include deep water blocks in the Gulf of Mexico that Exxon (XOM), Chevron (CVX), Royal Dutch Shell (RDS.A), BP Plc (BP), Statoil (STO), and Total (TOT) are said to have registered for bidding. Additionally, Mexico is said to be planning to export some of its crude to the West Coast in order to carve out a portion of market share in PADD 5. Saudi Arabia and Canada dominate exports to the West Coast with a cumulative market share of 46% as of 2016. Mexico has not consistently shipped crude to the West Coast since 2008 and it will likely be difficult for Mexican crude to compete with Canadian crude exports. 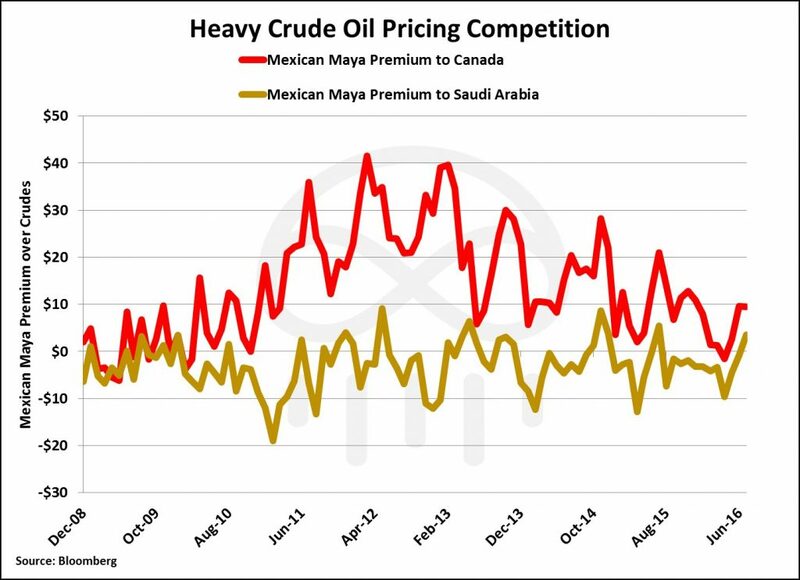 The sustained deep discount of Canadian crude oil continues to help Canadian oil outcompete crudes with high viscosity and sulfur content identical to Mexico’s flagship Mayan crude and similar to Saudi Heavy crude. Although expensive relative to Canadian crude, Mexican Maya shipments could compete with Saudi crude shipments to the West Coast because of Mexico’s proximity to the US West Coast. The Gulf Coast is the competitive refining hub for crudes imported from Mexico, Canada, Venezuela, Saudi Arabia, Iraq, Kuwait, and Columbia – and these countries account for 89% of imports into the Gulf Coast as of 2016. As crudes from Saudi Arabia, Mexico, Iraq, and Kuwait follow Canada and compete for market share, refiners in the Gulf Coast are likely to have a plethora of crudes to select for refining. 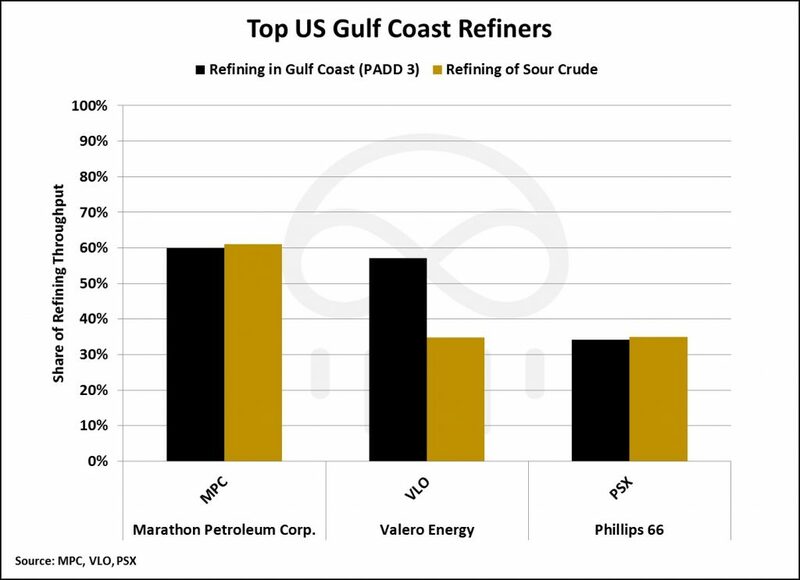 The largest refiners in the Gulf Coast capable of refining highly viscous crude with a high sulfur content (sour) will benefit the most from this competition. These three publicly listed pure-play refiners refine a combined 3.3 million barrels per day of crude oil in the US Gulf Coast or 35% of the refining capacity in the Gulf Coast. 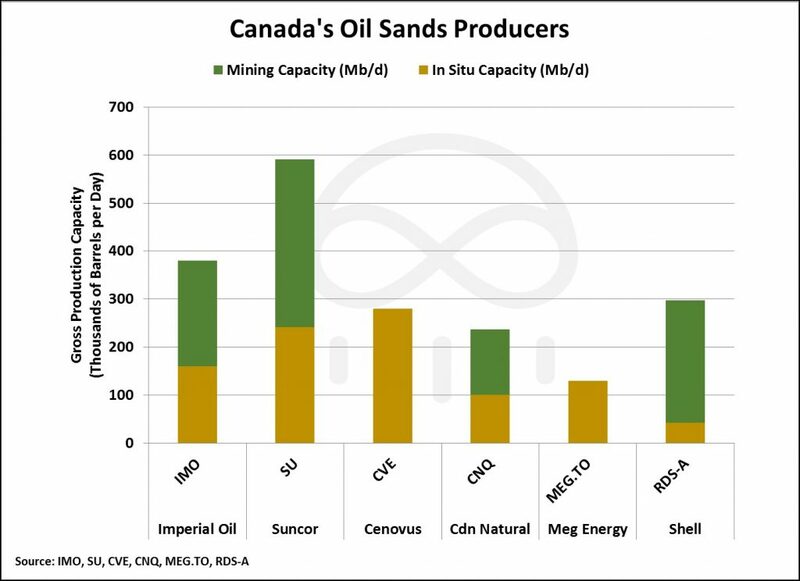 On the other hand, if investors believe that Canada will continue to increase its market share in refining hubs like the Gulf Coast, Midwest, and West Coast, then investors may want to take a look at companies who manage some of the top Oil Sands projects in Alberta.